As the Earth spins into fall and the long shadows of September remind me it’s back to school for families and harvest season for farmers and orchardists, I realize that we are in the midst of two seemingly unstoppable trends: the warming of our planet and the electrification of our energy system, which for the past century has been based almost solely on the production of fossil fuels. These two trends are inter-related, in that the switch from fossil fuels to electric vehicles should, in theory, stem the emissions of man-made greenhouse gases we know to be at least partially responsible for climate change. As we have written in our five-part series on climate change, the planet is warming, whether or not you subscribe to the theory that the hotter summers, droughts, melting ice caps/glaciers, stormy weather and higher sea levels are human-caused or part of a centuries-old climate cycle. Need we point to more evidence of this, consider that the summer of 2018 broke new records for heat waves across the world. In July Japan hit a new high of 41 degrees C (if you’ve ever been to Japan, combined with the humidity, that is unbearable), it was 52C in Death Valley, California (breaking a 102-year-old record), and in Ouargla, Algeria, the mercury climbed to 51C, believed to be the hottest temperature ever recorded in Africa. According to the U.S. National Oceanic and Atmospheric Administration, June 25 to July 25 saw 3,173 new daily maximums, 159 new hottest months and 53 all-time highs, CBC reported. Even in places known for temperate climates, it was sweltering. Sweden had the warmest July in 260 years while in the UK, temperatures hovered in the mid-30s, in a country better known for raincoats and brollies than flip-flops and sunscreen. Here in British Columbia, a spring and summer of virtually no rain made for tinder-dry conditions in the bush that were perfect for forest fires, usually ignited by lightning. 2018 has been the province’s worst fire season in history, breaking last year’s record. For most of August, BC was covered in a toxic blanket of forest fire smoke that had people unwilling, or unable, to go outside for weeks. The clouds of smoky haze were so large they could be seen from space. So climate change is real, and the world and its policymakers have woken up to the fact that something needs to be done about stopping the inexorable rise in temperatures. Whether or not that’s possible is a matter for debate (as we’ve written, the world will continue to warm, until it isn’t, meaning the best we can do is hope for the best and prepare for the worst), but what is not up for discussion is the growing and equally unstoppable trend of electrification. Politicians and business leaders have realized that no longer can we continue to pursue an energy matrix driven by fossil fuels (oil, natural gas and coal), while at the same time protecting the environment. Stopping the warming to the point when feedback loops like disappearing sea ice/warming ocean water, or melting permafrost and the escape of methane, push us past the point of no return (generally considered to be an increase of 2 degrees C) has become something of a religion for environmentalists. Thus, the era of electrification began. 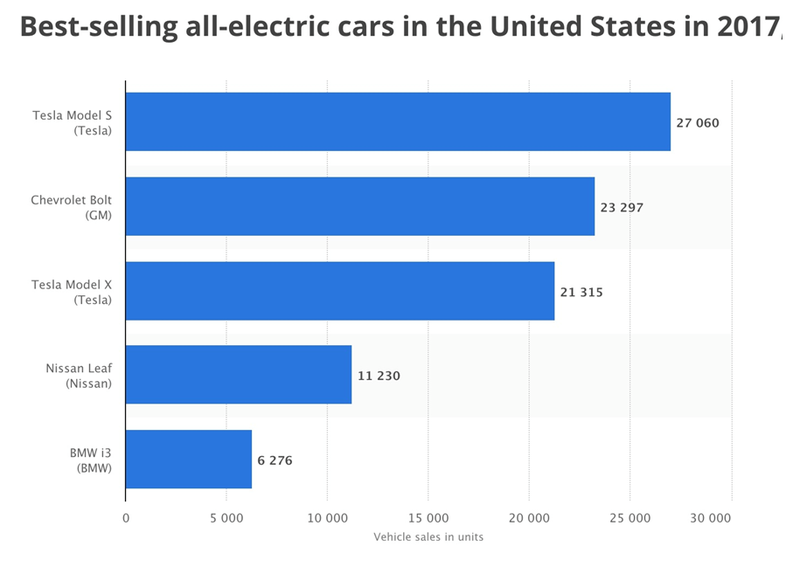 In the United States the electric vehicle trend started in 2009 with then-President Obama’s announcement that his Administration would spend $2.4 billion to support research on hybrid and electric vehicles and their battery components. What was once a quirky car owned by celebrities and left-leaning Californians has become the “vehicle” to stop climate change. That, and a shift to renewable energy. The emergence of Tesla on the scene made the electric car cool and despite their high price tags, Tesla models have sold well. But the most tangible connection between slowing rising temperatures (as well as cleaning up air pollution) and electrification is happening in China. Last year China sold about 700,000 electric cars, 200,000 more than 2016. The Middle Kingdom sees EVs as the key to unlocking the pollution dilemma that has plagued its car-choked cities. 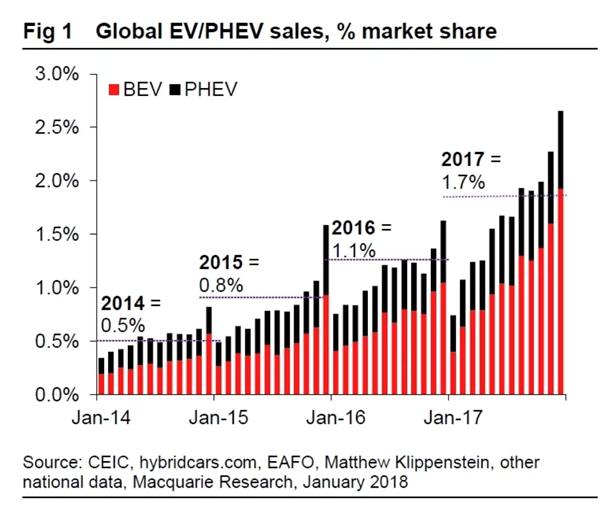 China represents over a quarter of the global EV market (by far the largest portion) and will own 40% by 2040 according to the International Energy Agency (IEA). Every major car manufacturer has electric models. Volvo has promised to phase out internal combustion engines (ICEs) from 2019. France has promised to end the sale of gasoline and diesel vehicles by 2040; the UK quickly followed suit. Almost a third of cars sold in Norway in 2016 were electric and Germany could outpace its neighbors as Volkswagen aims to become a leader in both EVs and automated vehicles. EVs surpassed 3 million units in 2017 and Bloomberg New Energy Finance predicts they will make up an astounding 54% of new car sales by 2040. None of this is news, but what is often left out of the conversation is how will the power be generated for all these new electric vehicles, which are all equipped with batteries that require regular charging? Take a look at those numbers again in the last paragraph. In 2017 73.5 million cars were produced worldwide. If half of those vehicles sold are electric, that’s 37 million EVs, all demanding power from the electricity grid. How on Earth are we going to produce it, without using fossil fuels? How many tonnes of coal would we have to burn? How many rivers would we need to dam? How much natural gas would we need to find and frack, along with the fresh water that becomes polluted from the process? Renewables are great, and pretty cool, but how many acres of solar panels would we have to lay down to capture enough sunlight to continuously power 37 million EVs? How many noisy, ugly, bird-murdering wind farms would we have to build? Of course, we already have a clean energy source, that has become somewhat sullied after the Fukushima disaster in 2011. Despite the incident at the nuclear power complex following the Japanese earthquake/tsunami, and a few radiation escapes that can be counted on one hand since nuclear power plants started in the 1950s, nuclear remains our cheapest, safest, and most energy-efficient source of power generation. 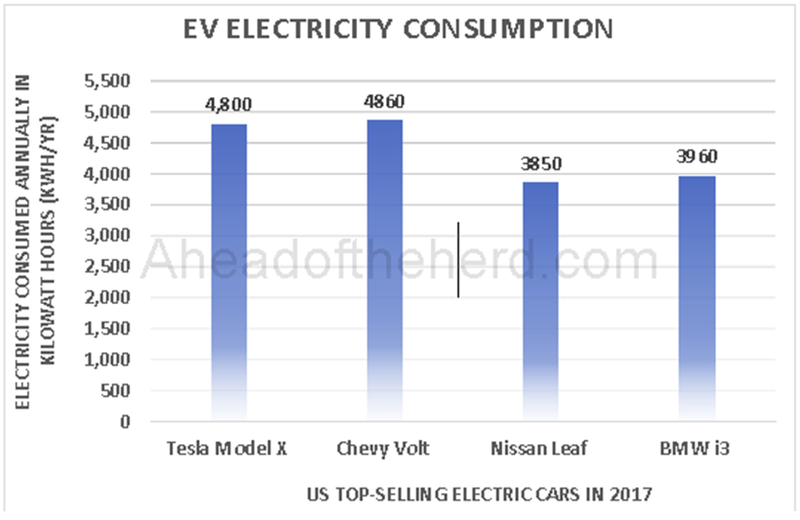 At aheadoftheherd.com we started wondering how much extra power would be required if electric vehicles start to penetrate beyond the current 1.4% (new car sales) of the total automobile market. So we decided to crunch some numbers. What options do we have available that could meet that increased demand for charging power? Spoiler alert: the answer is nuclear. Despite all the hype about electric vehicles, demand for them currently only represented 0.2% of global energy consumption in 2017. The IEA reports says that at current rates of penetration, “So far, the expanding numbers of EVs have had limited impact on electricity demand thus providing encouraging signs for the transition to greater electric mobility”, although it also notes that a study of traffic patterns in three major cities (Hong Kong, Long Beach and Manchester) suggests that charging EVs at night when grid demand is low, would help to avoid overloading the charging network. Of course, EVs are not going to stay at such a low percentage of global power consumption. The New Policies Scenario, part of the IEA’s “World Energy Outlook 2017”, projects that the global stock of EVs will rise sharply from 3.7 million in 2017 to 13 million by 2020, and in the following 10 years, will increase 10-fold to 130 million vehicles. 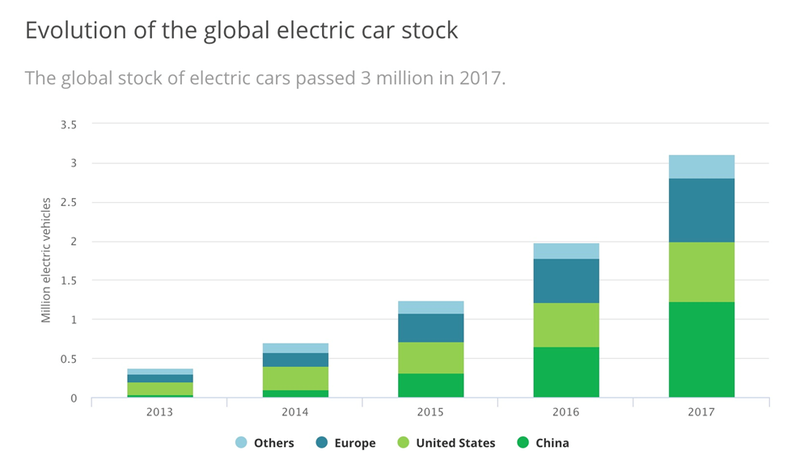 However the more ambitious [email protected] Scenario, in line with the IEA’s Electric Vehicle Initiative signed onto by EVI countries, projects a global stock of 228 million EVs by 2030 – about 100 million more than the New Policies Scenario. These are impressive numbers, but we wanted to know how much energy all these new electric vehicles would have on global energy consumption. To do that, we need to know how much electricity an EV uses per year. According to the U.S. Department of Transportation, the average American drives 13,476 miles a year, or 1,123 per month. Dividing the number of miles driven per month by the EV’s range (the number of miles possible on a single charge) gives you the number of charges per month. We decided to use the four top-selling EV models in the United States in 2017 for our calculations. (see chart below) Then we took an average. The Tesla X with a 100 kWh battery has a 289-mile range, giving it four charges per month. It uses 4,800 kWh per year. Next was the Chevy Volt, with a much smaller battery, 18.4 kWh. The Volt also has a shorter range, just 53 miles, and it has to be charged 22 times per month. When that is done, the Volt uses 4,860 kWh a year, similar to the Tesla X. The BMW i3, the fourth best-selling EV, has a 33 kWh battery and a 114-mile range. It requires 10 charges per month and uses 3,960 kWh a year. The energy miser of the bunch is the Nissan Leaf. The Leaf has a range of 150 miles and a 40 kWh battery. At eight charges per month, the Nissan Leaf uses just 3,840 kWh per year. Averaging the annual energy consumption of these four best-selling EV models gives us 4,365 kWh/yr. Remember the IEA’s Electric Vehicle Initiative projects a global stock of 228 million EVs by 2030. Multiply 228 million by 4,365 (the average consumption of the four top-selling EVs) = 992,220,000,000 kWh per year. Converting kilowatt hours to gigawatt hours (divide by 1,000,000) gives us 995,220 GWh of new electricity production needed per year by 2030. The New Policies scenario projects a global stock of 130 million EVs by 2030 using 567,450GWh. So according to the energy experts we are going to need somewhere between 567,450GWh and 995,220 GWh of new electricity production per year by 2030 just for EVs. 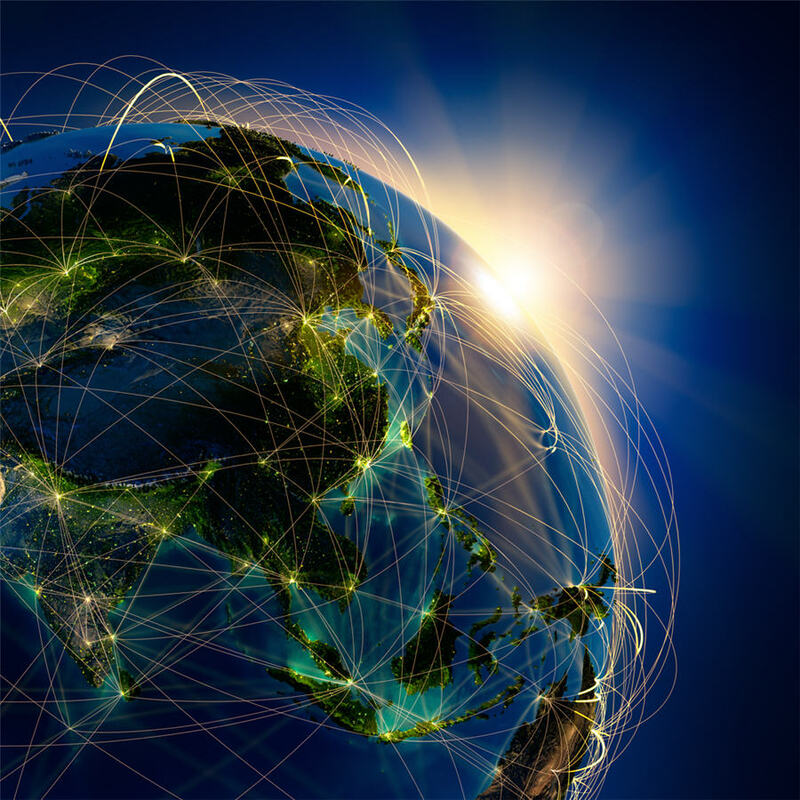 What does it mean in terms of total world energy consumption and production? We can get those numbers from the IEA’s “Key world energy statistics”. In 2015, the world consumed 9,384 Mtoe (million tonnes of oil equivalent). Mtoe though is awkward to work with so we convert it to GWh by multiplying by 11,630 (1 Mtoe = 11,630 GWh). That gives us 109,135,920 GWh. The point is, the addition of so many EVs to the current energy mix means that additional capacity, up to 1/100 of today’s total capacity, will be needed. Where should it come from? In order to fulfill the goals of mitigating the effects of climate change, and a reduction in our carbon footprint it should obviously not be from fossil fuels. So as the demand for EVs continues to rise, the alternatives are renewables (solar and wind), or nuclear power. “If the way forward into the future calls for higher energy densities, the notion that we can depend on solar or wind (which is another form of solar) represents a move backward. To get an idea of just how dilute a source solar is compared even to coal, consider a lump of coal capable of yielding a kilowatt-hour of electricity, which would weigh about a pound, and ask how long the Sun would have to shine on it to deposit the same amount of energy that the coal will release when burned. The area of its shadow, which measures the sunlight intercepted, would be about fifteen square inches. In Arizona in July, with a 24-hour annualized average insolation of 240 watts per square meter, it would take 435 hours, or almost three weeks , for this amount of surface to receive a kilowatt-hour of sunshine. For the average location in the U.S., allowing for bad weather and cloud cover, a reasonable estimate would be twice that. But to obtain a kilowatt-hour of electricity, at the ten to twenty percent efficiency attainable today, which appears to be approaching its limit, we'd be talking somewhere between thirteen and seven months. The Sun shining on forests for tens or hundreds of years affords an enormous concentration of energy over time that Nature performs for free. Subsequent geological compaction into coal adds another dimension of concentration in space, which humans carry further by their activities of mining and transportation. Hydroelectric power is another form of highly concentrated solar. The Sun evaporates billions of tons of water off the oceans, which fall on wide areas of land and drain through river systems to strategic points suitable for building dams. Once again, most of the work involving the concentration of energy in time and space on enormous scales is done for nothing by Nature. I wonder if the people who talk glibly about attempting to match such feats artificially really comprehend the scale of the engineering that they're proposing. A 1,000-MW solar conversion plant, for example – the same size as I've been using for the comparisons of coal and nuclear – would cover 50 to 100 square miles with 35,000 tons of aluminum, two million tons of concrete, 7,500 tons of copper, 600,000 tons of steel, 75,000 tons of glass, and 1,500 tons of other metals such as chromium and titanium – a thousand times the material needed to construct a nuclear plant of the same capacity. These materials are not cheap, and real estate doesn't come for nothing. Moreover, these materials are all products of heavy, energy-hungry industries in their own right that produce large amounts of waste, much of it toxic. So much for "free" and "clean" solar power. The comparison doesn't end there. When a power engineer talks about a one-thousand-megawatt plant, he means one that can deliver a thousand megawatts on demand, anytime, day or night. A nuclear plant can do this; so can a conventional fossil-fuel plant. But a solar plant can only operate when the Sun is shining, which straightaway gives it a maximum availability of 50 percent – low enough to be considered prohibitively uneconomic for any other type of power plant. To ensure supply when the demand is there, some kind of regular supply would have to be available as a backup anyway, making the whole idea of solar as a replacement unrealistic. Data from the World Health Organization shows that nuclear energy emits the lowest amount of carbon dioxide equivalent per unit of energy produced, when considering the whole cycle of emissions. According to the World Nuclear Association, nuclear is the second-largest form of low-carbon electricity after hydro-electric power. In 2015 the world produced 32,294 million tonnes of carbon dioxide – more than double the emissions released into the atmosphere in 1973. 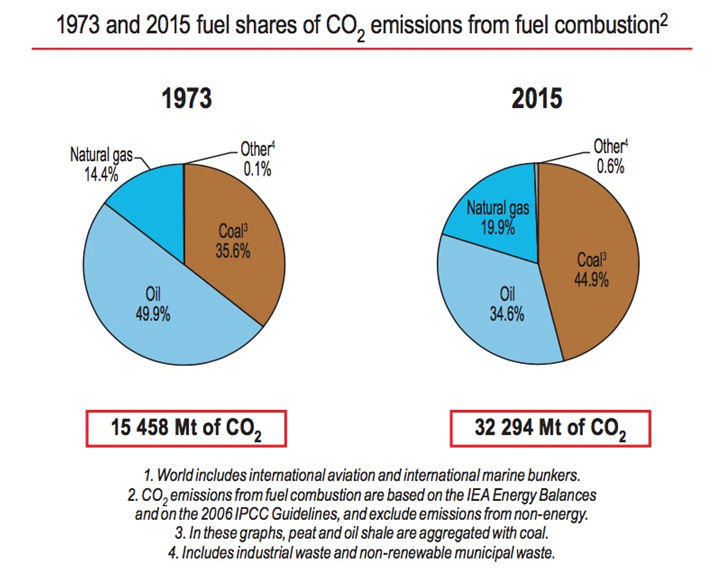 The majority came from coal, followed by oil and natural gas. The need for a reliable source of base load power is clearly at the heart of China’s nuclear program. According to the World Nuclear Association, China with its appalling air pollution is the leader with 17 new reactors under construction and 184 planned or proposed. Globally there are about 50 reactors under construction in 13 countries and another 150 planned, according to the World Nuclear Association. Most would be built in Asia, where demand for new electricity, including EVs, is highest. There are several reasons for choosing nuclear over solar. Despite its popularity over the past few years and the cost of solar power dropping significantly, it still suffers from several drawbacks including: high installation costs ($2,000 to $3,700 per kilowatt hour compared to $1000 for natural gas and $1,200 to $1,700 for wind); the large amount of land required for industrial-scale solar farms; and the fact that plants are limited as to where they can be sited; the intermittency factor, where power can only be generated when the sun shines, limiting solar to sunny climates; and the need to build new transmission infrastructure like power lines. The electricity needed for any country to successfully augment, if not replace fossil fuels, both for transportation and everyday use, will have to come from nuclear power generation. Coal and natural gas plants emit carbon dioxide emissions and natural gas needs an incredible amount of investment in pipelines and supporting infrastructure. Operating a 1,000-MW coal plant, for one year, produces 30,000 truckloads of ash that contains large amounts of carcinogens and toxins. Every second, up the smokestack, goes 600 pounds of carbon dioxide and ten pounds of sulfur dioxide. Extensive use of hydrogen is not practical due to its volatile nature and lack of infrastructure. Solar, wind and geothermal are all niche suppliers. Geothermal is limited to a few parts of any country and all three alternative means of generating electricity need massive investment in power transmission lines to get the power to where it’s needed. All three of these technologies are extremely important and each will successfully contribute, in a small way, to energy independence. But none are, today, capable of supplying base load power. A 1,000-MW solar plant would cover 129 to 259 square kilometers and use a thousand times the material needed to construct a nuclear plant of the same capacity. To equal the output of South Korea’s Yongwangs six 1,000-megawatt nuclear reactors, wind generators would require a 245-kilometer wide area extending from San Francisco to Los Angeles. Solar would require roughly 52 square kilometers of collector area. High emissions, a negative energy return and severe environmental costs are associated with ethanol and make its use impractical. Hydro – going to clean, eco-friendly energy isn’t accomplished by damming what free-flowing rivers are left. One pound of yellowcake (U3O8 – the final product of the uranium milling process) has the energy equivalence of 35 barrels of oil. One 7-gram uranium fuel pellet has an energy to electricity equivalent of 17,000 cubic feet of natural gas, 564 liters of oil or 1,780 pounds of coal. Nuclear power's life-cycle emissions range from 2 to 59 gram-equivalents of carbon dioxide per kilowatt-hour. Only hydropower's range ranked lower at 2 to 48 grams of carbon dioxide-equivalents per kilowatt-hour. Wind came in at 7 to 124 grams and solar photovoltaic at 13 to 731 grams. Emissions from natural gas fired plants ranged from 389 to 511 grams. Coal produces 790 to 1,182 grams of carbon dioxide equivalents per kilowatt hour, according to the IEA. Nuclear energy is the only proven technology that can deliver base load electricity on a large scale, 24 hours a day, 7 days a week, regardless-of-the-weather, without producing carbon dioxide emissions. Nuclear power plants emit no carbon pollution — no carbon monoxide, no sulfur oxides and no nitrogen oxides to the atmosphere. Natural gas accounts for 80% of the cost to produce power from a natural gas power plant. Uranium accounts for 5–10% of the price of nuclear energy. Nuclear energy is reliable. Nuclear power plants do not depend on weather conditions to produce electricity nor do they need costly electricity storage options. One ton of uranium produces more energy than several million tons of coal and oil. Fuel transportation costs are less and there is less impact on our environment from mining or fracking shale gas. Nuclear power plants require very little space and can be situated close to where their power output is needed. Given all these advantages, why aren’t we building more nuclear instead of focusing on solar and wind? In the World Energy Outlook 2017 nuclear doesn’t even get its own bar in a graph titled “Change in world primary energy demand by fuel” (it’s presumably lumped in with “Low-carbon fuels”. In a graph “Primary energy demand by fuel in China”, the world’s top energy consumer, nuclear’s paper-thin line is barely noticeable. At just 56 Mtoe, quantities for biomass and hydro are double. There is no mention of China’s plan to build 17 new nuclear reactors, with another 184 planned or proposed. Much of the neglect has to be dumped on Fukushima. The nuclear accident following the 2011 earthquake and tsunami in Japan had a devastating effect on the nuclear industry’s reputation as a safe form of power generation. The price of uranium abruptly crashed, Japan pulled all its remaining reactors offline for safety checks, and Germany – home to a strong anti-nuke movement – banned nuclear power, despite its need for nuclear plants to avoid using dirty coal. Nuclear however is not going away, despite its opponents. In June US President Trump asked his energy secretary to “take immediate action to stem power plant closures, arguing that a decline in coal and nuclear electricity is putting the nation’s security at risk,” Bloomberg reported. Up until recently Japan was out of the nuclear mix, with all but a handful of nuclear reactors shut down for safety checks following damage to the Fukushima Daiichi plant during the 2011 earthquake/ tsunami. But Japan which has no oil and gas of its own and depends heavily on nuclear, now has 9 reactors back in operation – a tripling from 2017 – and aims for nuclear to represent just under a quarter of its power mix by 2050. Japan’s Abe Administration is pro-nuclear. Russia is building 9 new reactors and India is constructing 7. Nuclear plays a key role in the IEA’s New Policies Scenario mentioned already. Under it, electricity generation from nuclear increases by 47% between 2016 and 2040, requiring a 100-GW increase in in capacity, or 25%. Global warming and the electrification of our energy supply are two constants that will likely be with us until the end of planet Earth. In 50 years people may look back at the fossil fuel age with bemusement, colored by anger and fear, at how the dogged pursuit of limited resources led to the environmental dilemma future inhabitants will likely find themselves in. The day to day lives of those future Earth dwellers will by then be vastly different from what we know today. 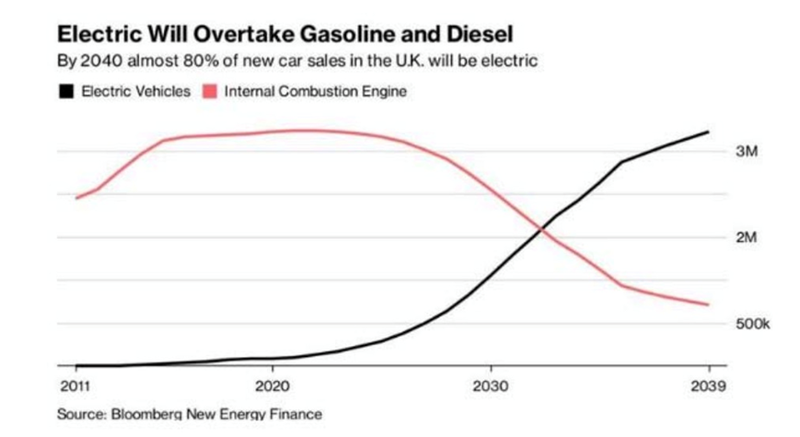 Predictions are that electric cars will be the norm, gas-guzzling muscle cars will be shown at classic car shows, and commuters will zip along on electric buses and trains, the smell of diesel a thing of the past. How do we get there? As we have shown, even a 40% penetration of EVs into the current automotive mix will mean a significant increase in electrical capacity. The need for 6% of current nuclear power plant capacity to power 29.4 million electric vehicles and 386,000 buses is not small. Our options are limited. If we want to stem the rise in global temperatures, with all their negative consequences for humanity and the environment, we must limit, or preferably, eliminate, emissions. It’s really down to renewables or nuclear. The drawbacks of solar and wind are well-known. Compared to nuclear, there is no contest in terms of the suitability for clean, stable, cheap base-load power to replace oil, coal and natural gas. Global demand for electricity is predicted to grow 76% by 2030 and nuclear is set to play a key role in meeting the demand. According to UxC, a nuclear consulting firm, nuclear power capacity could rise from the current 400 GW to over 483 GW by 2030. UxC also estimates uranium demand could grow nearly 60% by 2030. Currently low uranium prices have made three-quarters of uranium mines uneconomic, causing several to shut down. A supply shortfall is coming. That, paired with the impending renewal of long-term utilities contracts, and the depletion of spot supply, will combine to lift uranium prices finally, after seven years in the penalty box. Higher prices will mean more uranium production, which will eventually push down the price, but that would be good for utilities that buy nuclear and the industry in general. Nuclear power is a natural partner with electrification as the world seeks to meet greater demands for clean, reliable electricity generation. For all the reasons outlined above, I have nuclear power and uranium explorers – the best leverage to a rising uranium price – on my radar.